Dallas Arboretum's Pumpkin Village To Open September 19th! You are here: Home / Dallas/Fort Worth Events / Dallas Arboretum’s Pumpkin Village To Open September 19th! Dallas Arboretum’s Pumpkin Village To Open September 19th! 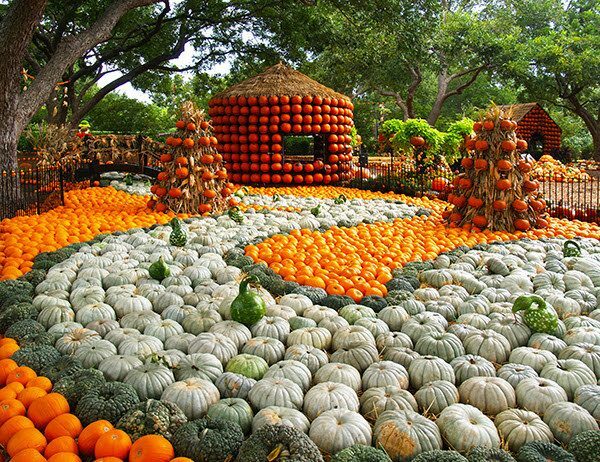 With the welcome change of seasons comes one of “America’s Best Pumpkin Festivals” according to Fodor’s Travel and one of the Dallas Arboretum’s most anticipated events –Autumn at the Arboretum – which opens on September 19 and continues through November 25, 2015. Autumn at the Arboretum is supported by Alliance Data and Texas Instruments. The highlight of the festival is the nationally acclaimed Pumpkin Village, which is created with more than 75,000 pumpkins, gourds and squash by the talented horticulture team.Dave Forehand, Vice President of Gardens, said, “As we say, ‘Everything is bigger in Texas.’ This is a record-breaking number for the Arboretum’s Autumn display, so it is only fitting to recreate an Old Texas Town in the Pecan Grove. Autumn is the perfect time of year for a picnic in the gardens or a leisurely walk among 150,000 fall-blooming flowers. The fall foliage, cooler weather and deep colors make Autumn at the Arboretum a must-see for locals and out of town visitors. Guests will find unlimited opportunities not only to create lasting memories, but also to capture them in photos filled with beautiful backdrops of spectacular color. The 10th Annual Tour des Fleurs, presented by W. B. Carrell Memorial Clinic, kicks off the opening of Autumn at the Arboretum on Saturday, September 19. This 10/20K race around the beautiful White Rock Lake starts at 7 a.m. and is followed by a post-race celebration touted by runners as “Dallas’ best after race party at the Dallas Arboretum.” The community is invited to bring and donate their gently-used sneakers September 14-18 to receive $5 off general garden admission, benefitting the Dallas Shoe Bank. Visit www.tourdesfleurs.com for information and registration. Daily, September 19 – November 25, 9 a.m.-5 p.m. The Pumpkin Village features a record number of 75,000 pumpkins, gourds and squash including the Tom Thumb Pumpkin Patch (pumpkins available for purchase), Old Texas Town Houses (made of pumpkins), Great Pumpkin Search, Hay Bale Maze and Cinderella’s Carriage in the Pecan Grove. Mondays – Fridays, September 21 – November 25, 11 a.m. & 2 p.m. Tea service begins with a demitasse of select soup, followed by a second course of assorted tea sandwiches and a third course of sweet treats. Price includes general garden admission. Reservations are required. Seated Tea is available to guests 13 and older. Cost is $47 per person and $57 per person for champagne tea. Private tea service and teas for over eight people are available upon request. To make reservations, contact 214-515-6511 or [email protected]. Mondays & Tuesdays, September 21 – November 24, 10 a.m.-2 p.m.
For moms, grandparents, caregivers and their children, these special days include a petting zoo, nature crafts, face painting and Kindermusik. Wednesdays & Saturdays, September 23 – November 21, 11 a.m.
September 24, October 22 & November 5, 9 a.m.-11 a.m.
Daily, September 19 – November 25, 11 a.m.-3 p.m. Celebrate autumn with mittagessen (that’s lunch, in German) at Café on the Green, serving a traditional German menu until Thanksgiving. Daily, September 19 – November 25, 11 a.m.-2 p.m. Weekends, September 19 – November 22, 10 a.m.-4 p.m.
Saturdays, September 19 – November 21, 12 p.m.-4 p.m.
Sundays, September 20 – November 22, 1 p.m.-4 p.m.
Back by popular demand, the main gardens are open for special after-hours enjoyment and photography. The event is intended for amateur photographers, portraits and hobbyists. Professional photo shoots require pre-arrangements with the sales office. Destined for the warmer climates of Mexico, the monarch’s annual overwintering takes them on a 3,000 mile journey deep in the heart of Texas. Specially planted salvia in the main gardens attract these regal and recognizable pollinators to the Arboretum. TheRory Meyers Children’s Adventure Garden, a Certified Monarch Waystation, also celebrates and studies the Monarchs this fall. October 3 & 10, 10 a.m.-2 p.m.
Monarch Migration Activities take place on the Moody Oasis, a rooftop garden in the Rory Meyers Children’s Adventure Garden that is filled with plants that attract butterflies. A face painter is available to paint butterfly faces on children. Special thanks to the Hagerman National Wildlife Refuge and the Texas Discovery Gardens for helping with this fun and educational day. October 10 & 11, 11 a.m.-1 p.m.
Children’s Activities in the Pecan Grove include crafts, face painting and more. October 12, 11 a.m. & 2 p.m.
Children’s concerts by Eddie Coker are sponsored by DallasChild on the Martin Rutchik Concert Stage & Lawn. Guests are invited to listen to live music overlooking the picturesque White Rock Lake while enjoying a picnic on the lawn. October 10, 1 p.m.-3 p.m.
Saturday & Sunday, October 24 & 25, 9 a.m.-5 p.m.
Trick-or-treat throughout the gardens with costumed characters and other family fun activities. Children are encouraged to wear festive costumes. Dallas’ premier outdoor concert series, presented by Wells Fargo, resumes in the fall with China Grove, a Doobie Brothers all star tribute band, on September 3 and runs through October 29 from 7 p.m. to 9 p.m. All concerts feature popular DFW food trucks. To purchase tickets and for more information, visit the Cool Thursdays Concerts page. For those wanting to have a representative come to their club or organization to share about Autumn at the Arboretum or another topic, contact the Dallas Arboretum speakers bureau at [email protected]. Autumn at the Arboretum is made possible by Alliance Data and Texas Instruments. For more information on Autumn at the Arboretum or any of the events, call 214.515.6500 or visit the Autumn at the Arboretum page.